What does American muscle mean? American muscle is the collective term for high-powered American cars, particularly those from the 1960–70s. We all have our own idea of the perfect car. For some of us, it is those iconic examples of American Muscle that are deemed a ‘must-have’ for any collection of cars. Who loves classic American muscle? We do! So the team at our West Carrollton store was happy to install a new @KENWOODUSA radio in this second gen #Pontiac #TransAm. Build a car based on today’s amazing technology, cover it in a skin that hints at the golden age of American muscle machines, and you have yourself a Chevy Camaro. Or a Ford Mustang. Or a Dodge Challenger...Point is, the romance of car rivalries from the past is an excellent way to market and sell more cars. Where does American muscle come from? Likening muscle to horsepower, American performance cars were first called muscle cars in the 1960s. A 1965 issue of Popular Science noted how the option of a high-horsepower Hemi-426 engine made the Dodge Coronet a muscle car. Car and Driver used the same term to describe the Pontiac GTO. Notable models of Buick, Chevrolet, Ford, and Plymouth cars, all of which tend to be two-door sports coupes, were also designated as muscle cars during this period. In 1977, as car imports were increasing in the United States, the Complete Guide to American Cars described this class of vehicle as American muscle. Car and Driver would call it “uniquely American” in 1985, so use of American muscle emphasizes the car’s American-ness as way of differentiating it from other vehicles (e.g., Australian muscle cars). American muscle began to take on an element of nostalgia in the 1980s. A business journal article from 1983 asked “Remember American muscle cars?” Car and Driver made reference to “good ol’ American muscle machinery” two years later. 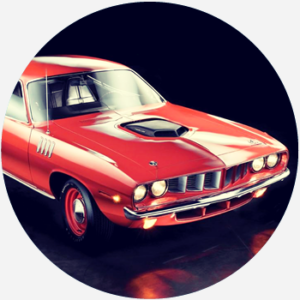 American muscle is widely used by classic car drivers, collectors, and enthusiasts as well as by museum exhibits and expositions of muscle cars. American Muscle is used as a brand name for model car kits and for Ford Mustang parts. Classic American Muscle is a vehicle-class designation used in motorsports competitions by the Sports Car Club of America. Prior to its automotive use, American muscle was used to describe the American labor force, American athletes, and American military power. American muscle is still sometimes used in these contexts. The band 1 AMVRKA released a song titled “American Muscle,” as “an ode to the working class” in 2017.